Mary Lou travelled extensively, painting in the Rocky Mountains and west coast of Canada, as well as in Pakistan, New Zealand, Australia and Japan. In her later years, she turned to writing, publishing several books. 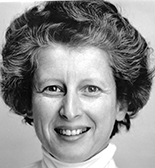 She was an active member of the Canadian Federation of University Women, finding inspiration in CFUW writing groups. She passed away on July 22, 2014, in Victoria. She is survived by her son, Malcolm; sister Laddie Hutchins; and cousins, nieces, and nephews. She was predeceased by her husband, Alistair Crerar, BA’48, MA’51, in 1998. A vivacious artist, photographer, storyteller, writer, and connoisseur of peaty single malts, she lived life to the fullest and encouraged others to do so.